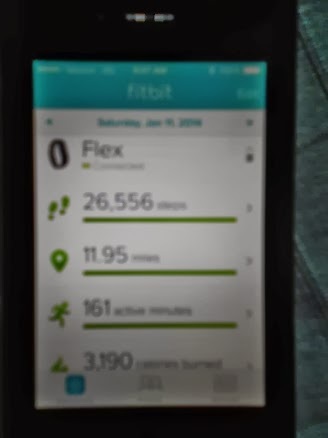 I ordered the Fitbit Flex from Amazon (a few dollars cheaper than other places). I chose the Flex vs the Force because the band was a little narrower and I’m not sure I need the immediate feedback the Force gives. What is a Fitbit? For those of you who have not heard of it, it is basically a fitness tracker. The Flex is a wristband you wear all the time. You receive a small USB device, which allows it to sync with your computer. It also syncs with several smart phones once you download the app. I have it on my iPhone. It will track your steps, convert it to miles, calories burned and you can log your food. You can even set alarms for reminders. In addition, it tracks your sleep. It counts the times you wake up and the amount of “restless” time you have. It times how long it is in sleep mode (you have to tap it to put it into sleep mode and then do the same in the morning). All this comes with the cost of the Fitbit. You can purchase a premium service called Benchmark for a yearly fee. Not sure what comes with that as all this is still new. The Fitbit syncs with several popular apps such as My Fitness Pal and Map My Run. I haven’t tried this yet, but I’m planning to try it with My Fitness Pal once I start logging my food. You can check it out yourself at the Fitbit Website. My package was delivered 2 days before I was leaving for WDW Marathon Weekend in Florida. Not having much time to explore all the features, I quickly set my goals and started wearing it. There are 5 lighted dots that show your progress as a percentage of your goal. When you reach your goal, they all light up and the device vibrates. The phone app and computer version both give you an easy to read dashboard showing your current progress in numbers. steps! Ok, this will be hard to beat on a daily basis. My goal for 2014 is to “stretch” the limits in my life. 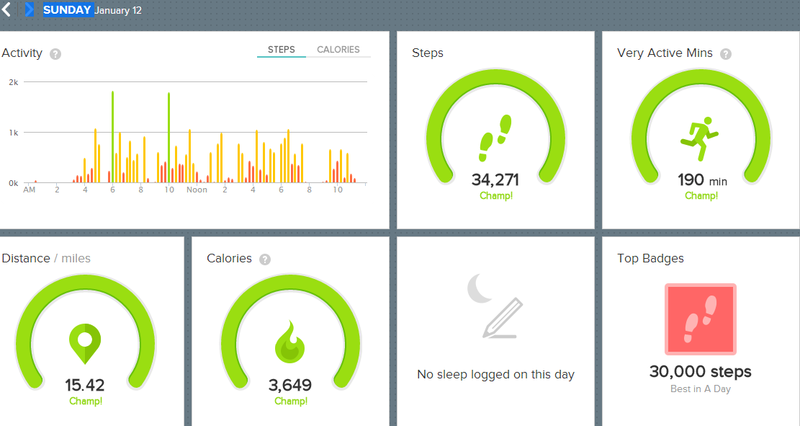 Now that I’m back to my normal daily activities, I am using my Fitbit to make sure I stretch the activity in my day. I’m challenging myself whenever I can. I’m going to start logging my food and see how that works. I also am thinking about joining a challenge group. There are so many groups, by age, location and/or interests. Yes, you can even join a Disney group! Do you use a Fitbit? Is it helping you reach your fitness goals? Have you joined any challenge groups?